Personalized beach bags. This lightweight navy blue eco-friendly jute tote is accented with a silk-screened palm tree and text that reads... On Beach Time. Great bag for a day trip. Front open side to side pocket and covered rope handles will make this a functional bag for beach or pool. 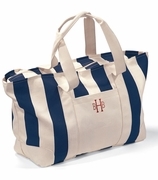 Large enough for extra beach towels, change of clothes, snacks, lotion and beach essentials. 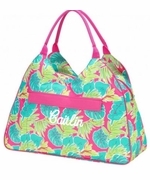 Personalized beach bag measures a wide 19"W x 14"H x 7" across bottom. Snap closure tote with inside wall pocket. The products were exactly as described with average quality for these types of products. The kicker was the service. I had two different items - one with embroidery - ordered for Mother's Day with only five business days to spare. Within 24 hours of my order, I received an email confirming the accuracy of the embroidered text I requested. Both items were processed, completed, and shipped on the second business day. I accompanied that with 2nd Day Air delivery service (my own procrastination cost me this service). I had the bags with a business day to spare. Their sense of urgency led to my Mother's Day success. I wasn't sure when I placed my order that I would get the bag in time to give as a gift for an early holiday celebration. I added a note to Simply Bags and they expedited my order without question, and I received the order in record time (a week earlier than expected)! I was very impressed with this gesture and because of this alone, I will definitely be using them again for future gifts. I thought the embroidery design was beautiful and love the vivid blue design with the constrasting bright red font. I wish the oversize bag would have been alittle more oversized and the interior of the bag constructed better. The rope handles seem secure and quality. Overall a nice gift but room for improvement with the quality of the bag.